We haven't heard much from Chicago from readers of the blog until today. Two great emails pop into the Cycle Chic inbox from The Third City. Both with clear an undeniable links to Copenhagen Cycle Chic. This is the story of Hank & me. Hank is my oma bicycle make by henry workcycles. Inspired by Cycle Chic and Copenhagenize, we're going Dutch for 365 days in the city of Chicago. That's right - no car, no spandex, no toe clips. Just my everyday clothes, a bike, a lock, and a set of panniers. Can we make it the year? Hank and I think so. Of course you'll make it! Because you're cool and Hank is cool and because 100 million Europeans do the same thing each day! :-) THIS is the kind of role model America needs in order to normalize everyday urban cycling. Now THAT is cycle chic at it's best. THAT is a Friday night in Copenhagen. Classy and chic and a cooler than cool bike to boot. The undeniable link to Copenhagen Cycle Chic is that Kimberly runs the very bespoke Indigo Yacht Charters and among their destinations are the Virgin Islands - part of which was formally owned by Denmark until sold to the USA in 1917 for $25,000,000. Thanks to you both for thinking of us! Any more photos? You know where to send them. The virgin islands were sold to The United States in 1917 and not in 1925.
thanks for sharing the Hank love! Any reason why the second picture doesn't open up to a larger image as do the rest? After seeing the beautiful photos,I decided to visit there this year. first of all, i have spent the past month reading your blog from the beginning post to today's. to see that my blog graces yours is the highest compliment that i can imagine. i am honored and greatly appreciate your intent, photography, and global perspective. as a matter of fact, if i make it the 365 days (and i'm sure i will), my reward will be a trip to your fine city. thanks for the inspiration and support. amber, chicago is a great city. if you do come, shoot me an e-mail letting me know when. i can loan you a bike and give you some tips. aLex... if you make it to Copenhagen... i'll show you around. my wife and I have some extra bikes for visitors. Just a note: chicago is known as the Second City in the U.S. Great city, you have to visit sometime. We be lovin' us some aLex here in Seattle and are looking forward to the national news media frenzy when she finally unpacks Hank from the crate today. 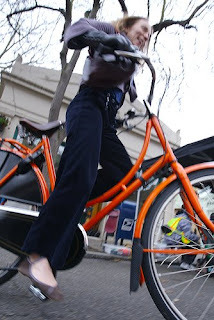 Just a little footnote: that picture of Amanda on Seattle's Ballard Ave standing over what is soon to be aLex's orange Oma was was snapped by photographer Gregg Bleakney who is now somewhere on his bicycle between Seattle and Wyoming snapping more pictures.